1. Reference G is the current operational level guidance on detention issues. This TACSOP gives further direction and guidance to commanders and staff responsible for detention operations within Afghanistan. Commanders at all levels are to ensure that detention operations are conducted in accordance with applicable international law and human rights standards and that all detainees are treated with respect and dignity at all times. The strategic benefits of conducting detention operations in a humanitarian manner are significant. Detention operations that fail to meet the high standards mandated herein will inevitably have a detrimental impact on the ISAF Mission. All ISAF Detention operations will be subject to internal and external scrutiny. 2. 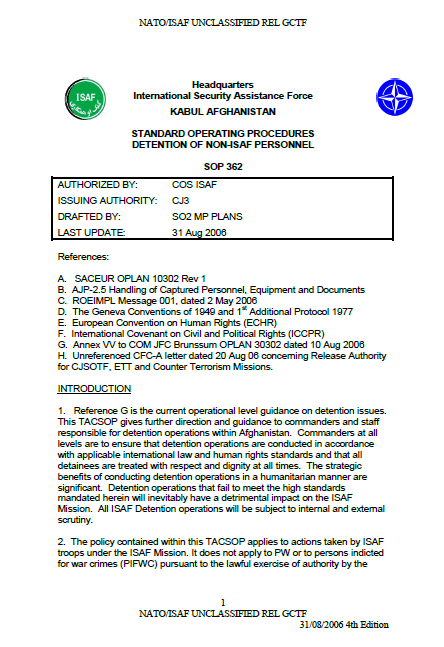 The policy contained within this TACSOP applies to actions taken by ISAF troops under the ISAF Mission. It does not apply to PW or to persons indicted for war crimes (PIFWC) pursuant to the lawful exercise of authority by the International Criminal Court or other lawfully constituted tribunals. It does, however, give direction to Regional Commands on the reporting of detainees taken within their AOO by troops operating under the Counter-Terrorist mandate (Reference H refers) or by ANSF operating jointly with ISAF. 3. The following definitions are used throughout this SOP. a. NATO Holding Facility / NATO Detention Facility. This term refers to any facility used, designed or adapted to facilitate the detention of individuals. b. ISAF Detention Authority. This is defined in the main body of this SOP as a specified individual authorised to make detention decisions. These individuals are listed in Para 6 below. c. Period of Detention. This is regarded as the period of detention, not to exceed 96 hours, which starts on arrest (ie; the act by which a non-ISAF person is deprived of his liberty by ISAF personnel) until the moment a detainee is handed over to the ANSF or GOA officials or is released by ISAF. d. ANSF. The abbreviation ANSF stands for Afghan National Security Forces and includes, Afghan National Army (ANA), Afghan National Police (ANP), Afghan Border Police, Afghan Highway Police, Afghan Counter-Narcotics Police and any authorised Afghan national or regional government agency involved with security or detention facilities. (1) Adult. An adult is considered to be any person aged 18 or over. (2) Juvenile. A juvenile is considered to be between the age of 15 up to 18. (3) Child A child is considered to be below the age of 15. 4. Authority to Detain. 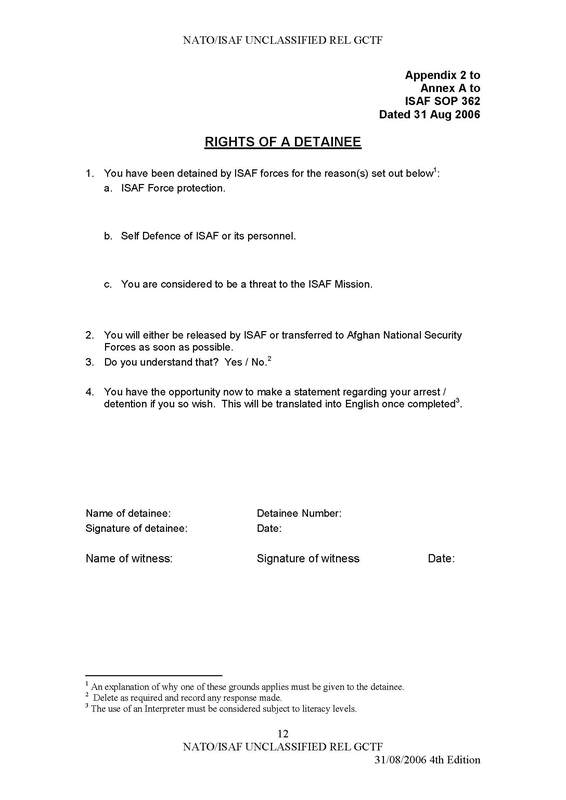 The only grounds upon which a person may be detained under current ISAF Rules of Engagement (ROE) are: if the detention is necessary for ISAF force protection; for the self-defence of ISAF or its personnel; for accomplishment of the ISAF mission. 5. Detention. If an arrest and/or detention is effected by ANSF with ISAF support, then the individual is not considered to be an ISAF detained person and the provisions of this TACSOP do not apply. An individual will not be considered as an ISAF detained person until and unless ISAF assumes control and places that individual into detention. In all cases of detention HQ ISAF is to be informed. The current policy for ISAF is that Detention is permitted for a maximum of 96 hours after which time an individual is either to be released or handed into the custody of the ANSF / GOA. i. Commander of the Theatre Detention Facility. 7. The powers of the Detention Authority. A Detention Authority may authorize detention for up to 96 hours following initial detention. Should the Detention Authority believe that continued detention beyond 96 hours is necessary then, prior to the expiration of the 96-hour period, the Detention Authority shall refer the matter via the chain of command to HQ ISAF.